What are we to make of the hunger strikes spreading through California’s prison population? 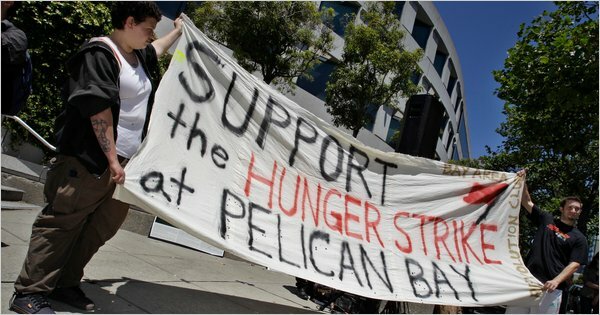 Starting in Pelican Bay, a “supermax” prison for inmates convicted of the worst of crimes, it has reportedly spread to thirteen prisons; at least 6,600 prisoners have refused meals. People protest, in general, when they believe it’s both necessary and potentially effective in helping them get what they want. In choosing to protest, and in choosing how to protest, they make decisions about what’s possible, and the risks that they are willing to engage. Risks and resources vary depending upon who you are and who you face; it’s hard to think of many worse-positioned for effective collective action than prisoners. Inmates, convicted of heinous crimes, are hardly a group that inspires broad public sympathy. But prisoners in California suffer from thirty years of populist criminal justice policies. California has unusually long sentences, buttressed by a “three strikes policy,” the highest recidivism rate in the country, and insufficient funding to pay for what Federal courts consider basic humane treatment. California politicians, however, have learned that harsh sentencing without adequate budgets, as long as the corrections officers are well-paid, is an easy way to garner support. Opposing the sentences, the prison guards, or calling for taxes to fund mass incarceration, in contrast, are sure political losers. Several rounds of court orders from federal judges have generated little in the way of reform. In May, the US Supreme Court ordered California to reduce its prison population by 30,000. Resistance, even to the Supreme Court, and general foot-dragging is the easy political strategy; you don’t win elections by releasing prisoners. But what can the prisoners do? They certainly can’t march and rally, produce television ads, or make large contributions to electoral campaigns. They can stop cooperating, at least in ways that don’t generate even harsher treatment. Just how the inmates were able to organize a collective refusal remains a question. It’s very clear that organized groups outside prison have been critical in passing information, both between the prisoners, as well as information about the strike to a larger public. This has been critical, as information about prisoners’ actions has been tough to come by. Initially, officials at the California Department of Corrections and Rehabilitation (CDCR) had reported that fewer than two dozen inmates were involved in the strike. 1. Eliminate group punishments. Instead, practice individual accountability. When an individual prisoner breaks a rule, the prison often punishes a whole group of prisoners of the same race…. 2. Abolish the debriefing policy and modify active/inactive gang status criteria. Prisoners… can escape these tortuous conditions only if they “debrief,” that is, provide information on gang activity. Debriefing produces false information (wrongly landing other prisoners in SHU, in an endless cycle) and can endanger the lives of debriefing prisoners and their families. 4. Provide adequate food. Prisoners report unsanitary conditions and small quantities of food that do not conform to prison regulations…. The CDCR has both denied the charges and defended its policies. 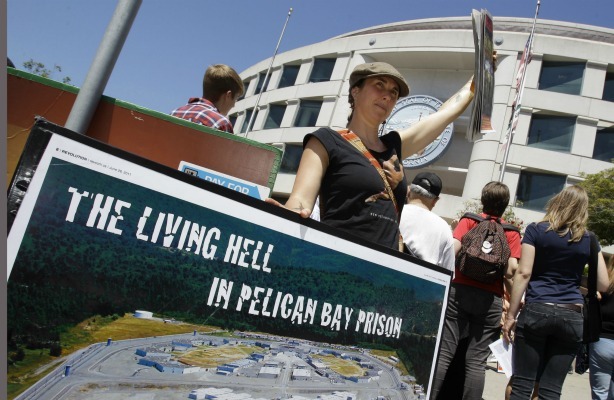 Most of the thousands of inmates have fasted for a few days or a few meals, but some of the Pelican Bay inmates have announced that they are willing to starve themselves to death. The CDCR can forcefeed inmates incapacitated enough that they can’t refuse treatment. The strike has succeeded in getting the prisons in the news, and putting the inmates’ concerns on the same crowded political agenda that includes fee hikes at the University of California, the closure of state parks, and significant cuts to California public schools–and much else. What happens next is largely about how involved people outside the prisons get. This entry was posted in Uncategorized and tagged California, hunger strike, prisoners. Bookmark the permalink. A harrowing, down-and-dirty depiction—sometimes reminiscent of Steven Soderbergh’s Traffic—of America’s war on drugs, by former dealer and California artist Langohr.